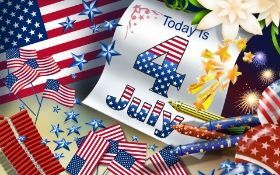 The 4th of July is like christmas without Santa; it's vacuous and irritating to those of us who actually look for meaning behind the symbolism, words and activities associated with the holiday. Not celebrating the 4th of July is like getting clean off of pills. Once you do it, you realize that you can never go back, even though your life used to be a lot more fun.